This modern adaption to the Girl in the Red Cap is all you need for daytime with your little one. 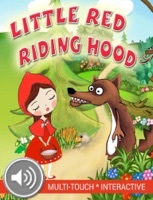 With soothing narration and adventure at the touch of your screen, rediscover why the Big Bad Wolf isn’t so bad after all. -These classic stories are now available as interactive touch books. Optional narration and easy interactive images allow for plenty of special moments with your child. Best for car rides and daytime for the little ones!